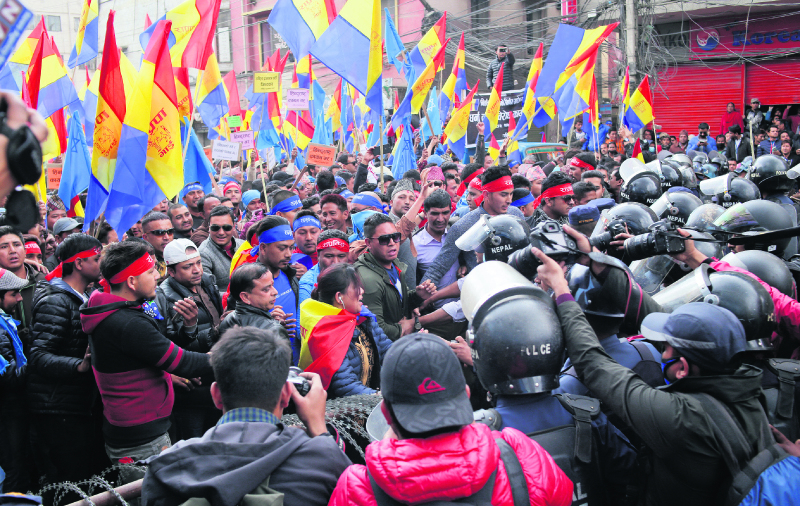 KATHMANDU, March 20: Kantipath, a renowned street in the capital named after a queen, turned into battleground for hours on Monday after violent clashes broke out between police personnel and cadres of the Rastriya Prajatantra Party (RPP), who were trying to stage sit-in in front of the Election Commission. Several protesters including RPP senior leader Pashupathi Shumshere Jung Bahadur Rana and television personality Komal Oli, who is also an RPP leader, were injured during the scuffle. The Metropolitan Police Division said the clash ensued after an “unruly mob” tried to enter the EC building and resorted to vandalism. RPP leaders however accused the security personnel of suppressing a peaceful protest. The RPP, which is one of the key ruling coalition partners, was protesting against the removal of the terms “Hindu State” and “constitutional monarchy” from its statute by the EC. On March 17, the EC had removed the terms “Hindu State” and “constitutional monarchy” from the statute of RPP stating that they contradict the spirit of the constitution. Later on the day, RPP Chair Kamal Thapa, who is also a deputy prime minister and minister for local development, submitted a memorandum to the EC asking the constitutional body to rethink its move. “RPP has reservations over some provisions of the constitution, but it is fully committed to following the constitution and puting it to implementation. The RPP urges the EC to rethink its March 17 decision which seeks to revise our party statute,” reads the statement. Before submitting the memorandum, RPP Chair Thapa took part in a sit-in organized by the party against the EC’s move and use of force by the police. RPP leaders and cadres had staged a rally in the capital before converging into a mass gathering at Jamal. The situation turned violent after police tried to stop protesters from approaching the EC building. The crowd reacted by hurling stones at the security forces. In total, police fired five rounds of teargas canisters to take the situation under control. Injured Oli, and other injured were treated at Kathmandu Model Hospital. 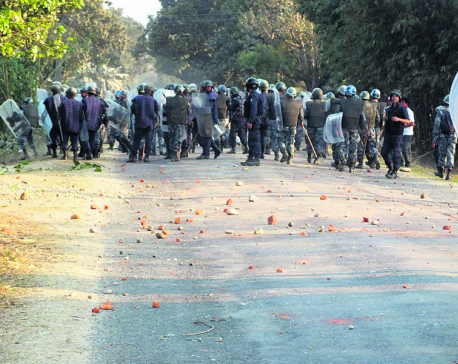 According to RPP’s assistant spokesperson Mohan Shrestha, at least 47 RPP cadres were injured.